OUR PULL-THRU RV SITES ARE LARGE ENOUGH TO HANDLE THE BIG RIGS. EACH SITE IS grassy & level and comes EQUIPPED WITH 30/50AMP SERVICE, WATER, SEWER & WI-FI. At Sage Hills Golf & RV Resort we love to accommodate RVers. From water and power, Wi-Fi , amenities, play & stay golf packages and on-site park host, we’ve got you covered. Most sites come standard with a picnic table, a recreation room with grill, and our friendly service. Take a dip in our sparkling heated swimming pool, lower your golf handicap or just relax poolside. Outside our resort, you can enjoy the small town charm with larger city opportunities. Perfectly nestled between the Tri-Cities and Moses Lake, the possibilities are truly endless! 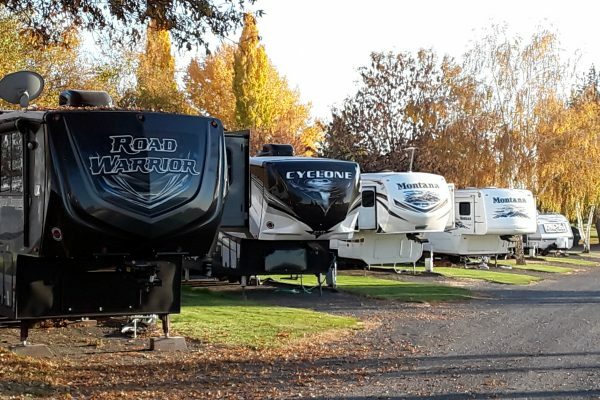 Our full hookup RV sites accommodate everything from pop-up campers to motorhomes with options ranging from shady sites, 30 or 50amp to golf course and mountain views. You will find that Sage Hills Golf & RV Resort caters to your needs. We are a pet friendly RV Resort and pride ourselves on creating unique RV camping experiences for our guests through our many features!